Balram falls on Mahadev/Batuknath’s feet calling him prabhu/god. Nand asks why did he fall on Batuknath’s feet. Krishna says Dau fell down. Nand asks why was he calling Prabhu. Krishna says Batuknath’s nickname is Prabhu and takes Batuknath along. He reaches Radha who asks if he came for Chandravali, then she is not here. Krishna says he brought someone to meet her and introduces Mahadev as Batuknath to her. Mahadev greets Radha as Devi. Radha asks who is devi here. Mahadev says every woman is respectable and addressed as devi. Krishna asks them to continue chatting as he has to meet Chandravali. Radha gets jealous hearing that. Balram asks Krishna why did he leave Mahadev with Radha. Krishna says Mahadev will teach her value of love. Balram says he is worried for Mahadev as even he cannot bear Radha’s anger. Krishna says fate has sent Mahadev to convince Radha. Mahadev asks Radha if he can help her. She asks to keep flower vases on the other side. Mahadev does same and asks if she is fine as she looks tensed. Radha says she is fine. He says her face shows she is tensed. Radha asks how does he know. He is very experienced in judging girls. Radha asks what.. He says that he is already married. Radha asks where is his wife then. He says his wife is at home and she kicked him out of house as their wedding anniversary is coming and she needs an unique pearl which can unite 2 lovers. Radha angrily says there is no love at all, it is only betrayal and runs away from there. Mahadev thinks it is very difficult to convince Radha and he cannot go back to Kailash so easily. Krishna walks to him saying sister Gowri’s challenge is very tough for him. He says it is tough, but not impossible, he will reunite Narayan/Krishna and Narayani/Radha and get unique love pearl. Radha stands jealous seeing Krishna chatting with Radha laughing. Ayan tells her if she agrees, he can get Chandravali rid off Krishna’s life. Radha says she loves Krishna and does not mind if Krishna wants to stay with Chandravali. She walks away. Ayan thinks Radha will obey her soon and then..
Vrishbhan announces shivling moulding competition between Barsana and Vrindavan on the occasion of Mahashivratri and whoever moulds shivling first will be pronounced winner and that shivling will be established for pooja. Everyone chant Har Har Mahadev. Vrishbhan asks Batuknath to chant Mahadev’s name and start competition as he is a judge. Mahadev asks Narayan/Krishna how can he chant his name himself. Krishna says sometimes it is necessary to chant one’s name to one’s identity and know truth. Batuknath chants Har Har Mahadev. Everyone chants same. Krishna asks Chandravali to hurry up as they have to win. Ayan asks Radha if she wants opponents to win. Radha says never. They start mixing soil and moulding shivling out of it. Radha mixes soil looking at Krishna and Chandravali. Krishna thinks Radha should control her jealousy, else a big disaster will happen today. Radha drops shivling mud looking at them. Vrishbhan thinks why Radha is unable to mould shivling. Mahaev thinks she should be careful and prepare shivling, when she can build whole world, shivling is very easy for her. Krishna moulds shivling, paints it black and says his shivling is complete. Batuknath announces Krishna and Chandravali as winners. Radha stands more jealousy. Mahadev asks Krishna if he is not happy with his win. Krishna says it is not complete yet and addresses everyone that he does not know to draw tilak on shivling, so if Chandravali knows. Chandravali says no. Krishna shows fake sadness. Kirtida says Radha draws beautiful tilak. Krishna says is it, can Radha draw it. Radha nods yes. Krishna says when he is incomplete without Radha, how can his respectable’s shivling’s decoration be complete without Radha’s help. Krishna gives moral gyaan that all diamonds have defect in it, there is no animal poisonous than snake and no animal simle than snake which goes in its own way; similarly a human is both harmful and helpful, it is up to them what nature they use. Precap: Mahadev asks Krishna to permit him to fill life in shivling and does same. Krishna disguises as Mahadev and Chandravali as Gowri mata. Ayan provokes Radha to spoil shivling by keeping some inauspicious flower on it. 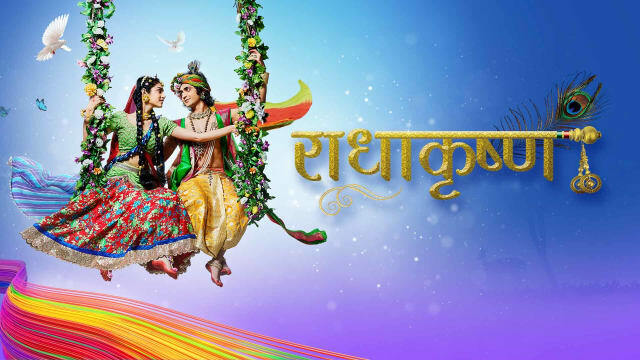 The post RadhaKrishn 6th March 2019 Written Episode Update: Radha Competes With Krishna appeared first on Telly Updates.